Spring has sprung, and Summer is in the not-too-distant future. Many already have plans in the works to entertain outside and spend time by the pool. Every year after the rainy season (which according to some meteorologists may be elongated courtesy of El Nino) homeowners, tenants, and building managers discover that decks are often dirty or discolored. 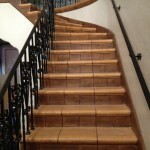 Surfaces that have not been maintained for an extended period of time may even suffer from damaged subfloors and plywood, which is frequently given away by cracked, bubbling, or soft coatings. 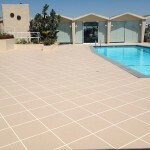 For Magnesite, Desert Crete and Stamped Concrete Overlays, collected dirt and dust is unsightly, and can mask damage due to environment and impacts. Western Magnesite recommends keeping your decks clean by regular sweeping. Diluted SimpleGreen will clear up most spills and stains. 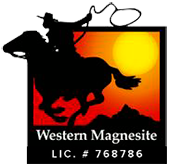 For more information on cleaning, Western Magnesite also recommends resealing your Magnesite decks every 20 months, and 30 months for Desert Crete or Desert Flex fiberglass-based decks. Resealing keeps your decks looking new, and ensures full warranty coverage. 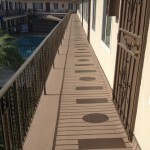 If you have any doubts about the condition of deck coatings on your property, Western Magnesite Company is here to help. Be sure to give us a call at (800) 937-8624 to request a visit from a knowledgeable estimator. Make sure your deck is in perfect shape for the summer, so that it will be ready to weather the winter. With regular care and maintenance, you’ll get years of use and lasting durability out of your deck system.